​non-profit professional jazz orchestra; its equal can be found in only a handful of North American cities. To lead an ever-expanding and advancing program of big band performance, composition and education. Dr. Richard Gillis and Sasha Boychouk founded the Winnipeg Jazz Orchestra (WJO) in 1997, inspired by a vision of forming a professional big band with the best emerging and veteran musicians in Winnipeg. Gillis and Boychouk were the right people at the right time, but the WJO also owes its roots to the collective efforts of many passionate stakeholders including the musicians, board members, volunteers and administrators who sensed a potential audience that was not being served. 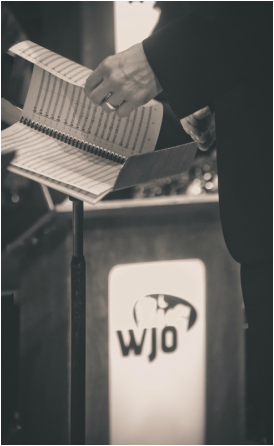 Their familiarity with the Winnipeg music environment (the key players, the marketplace, and the community’s appetite for jazz) gave them confidence in the capabilities of local musicians and out of that natural savvy and inherent enthusiasm, the WJO was born. ​ Commissioning new works and connecting with and inspiring students and young musicians is an integral part of the WJO vision. Today, the orchestra roster boasts 16 to 25 Winnipeg-based musicians whose combined resumes touch every corner of performance jazz locally, nationally, and around the world. WJO’s popularity has grown steadily over the course of the band’s history, from small, informal events at the West End Cultural Centre to a six-concert season and sold-out performances at the Winnipeg Art Gallery. ​ To be a leading performer, promoter and developer of big band music in Canada. The Winnipeg Jazz Orchestra has developed an interesting and dynamic model for the promotion and performance of big band music in Canada. The organization performs a jazz series in a concert venue, it has a not-for-profit charitable structure, and the objectives are related to performance, composition, and training. The vision statement is challenging the WJO to play a national and potentially international leadership role in this genre of music. Our model can be shared and we can be part of encouraging this type of organization in other communities. We expect that the fulfillment of this mission would include the WJO growing in its service to the community, and serving as a model and resource to other similar organizations elsewhere. Part of the vision is the building of a network of individuals and groups sharing our objectives. Part of this would include building our reputation through regular recording of our work.